George Clooney has revealed that he and his wife Amal have decided to restrict their travel to avoid 'dangerous' countries while she is pregnant with twins, saying they need to be more "responsible". 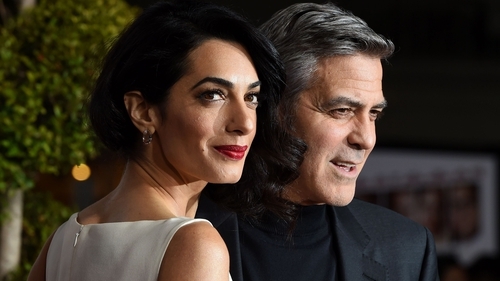 The Hollywood actor and director and human rights lawyer confirmed earlier this month that they are expecting twins, and Clooney says it has forced them to reconsider the countries they visit. Speaking to French publication Paris Match, he said: "We decided to be much more responsible, to avoid the danger. "I won’t go to South Sudan anymore or the Congo, Amal will no longer go to Iraq and she’ll avoid places where she knows she isn’t welcome." The 55-year-old actor has been an advocate for the resolution of the Darfur conflict in southern Sudan, while Amal's work as an international human rights lawyer means she often visits dangerous territories for her clients. Meanwhile, the parents-to-be are still trying to decide where to raise their children when they are older. He added: "People think we are never together, but we have not been separated for more than a week." The Monuments Men star also put paid to the tabloid rumour that they were expecting a boy and a girl, saying: "I don't know where this rumour comes from that we're going to have a boy and a girl. We ourselves don't know yet and don't want to know." The couple tied the knot in an intimate ceremony at the Aman Canal Grande luxury resort in Venice, Italy in 2014. They were married by Clooney's friend Walter Veltroni, the former mayor of Rome.